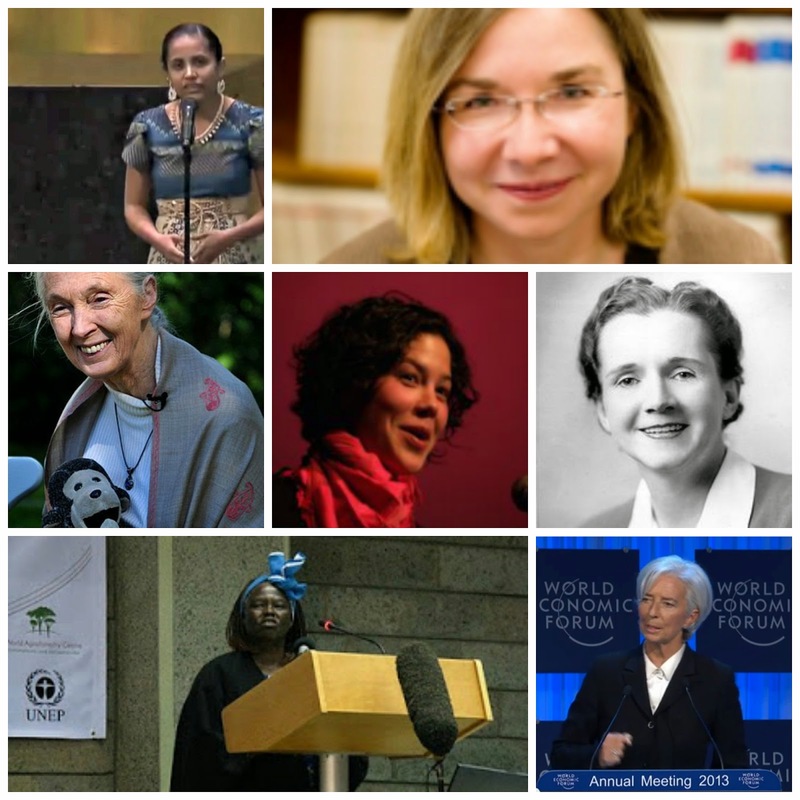 Next week, we celebrate Earth Day, and it's no surprise that women have shaped so much of the public speaking about environmental issues. I've pulled these seven speeches from The Eloquent Woman Index of Famous Speeches by Women to showcase their messages about the environment, from pesticides and wildlife conservation to economic arguments for dealing with climate change. Rachel Carson's "A New Chapter to Silent Spring" was a 1963 speech to the Garden Club of America, taking her clarion call about the effects of pesticides on human health and the environment right to the people. Her conviction about her message helped her overcome her public speaking fears and changed our environment for the better. Severn Suzuki's 1992 UN Earth Summit speech was delivered when she was just 12 years old, and she wisely kept her message in the voice of a child. "If you don't know how to fix it, please stop breaking it!" she urged the delegates. Jane Goodall's "What separates us from the chimpanzees" uses unusual tactics, from sound "props" to Shakespearian influences, to put her message of wildlife conservation across. Another scared speaker, she learned from experience the value of speaking to live audiences to get her environmental message across. Nobel laureate Wangari Maathai's hummingbird fable was a simple tale she used to convince audiences ranging from poor women in Kenya to powerful world leaders that a small volunteer effort could do much to protect important ecosystems. In her case, a campaign to reforest Kenya led to the planting of 30 million trees--and a Nobel Prize. Christine Lagarde's speech on "dynamic resilience" led the World Economic Forum in 2013. Titled "A new global economy for a new generation," the International Monetary Fund's managing director put the assembled financial titans on notice that climate change and its effects had to be central to their efforts to reshape the world's economy. Kathy Jetnil-Kijiner opened the 2014 UN Climate Summit after winning a competition to be the citizen voice at the session. She combined a short appeal to the audience with a dramatic poem based on her experiences in the Marshall Islands, creating vivid imagery to get the deliberations off to an emotional start. Katharine Hayhoe's "elevator speech" on climate change is less than 90 seconds. But in that time, the climate scientist and evangelical Christian shares how you should do it, then shows you how it's done.